This is a basic soup, meant for sustenance rather than to showcase one’s culinary prowess. When constructing this recipe, I carefully took several things into consideration. First, that most of these roots would have to be foraged. The Brothers of the Night’s Watch are north of the Wall, which dramatically changes their supplies. They don’t have access to a pantry, and could only cook what they found or had brought with them. I considered the roots to be foraged, a task I would have loved to experience firsthand, although I foraged mine from a variety of grocery stores instead of a forest. Salt pork is an easy enough thing to travel with, as is a bit of grain, such as barley. I happened to have cracked barley, and used that, figuring it would approximate the condition of barley after traveling in a saddlebag for a long while. The fun of a recipe like this is that you get to construct it much the same way that the Brothers would. The ingredients list is flexible, so you needn’t stress about finding obscure roots in order to make a perfect copy of my version. Forage among your local markets, in your pantry, or if you’re lucky enough, your own backyard. Or your neighbor’s: I won’t judge. But it’s all about the experience and mindset. 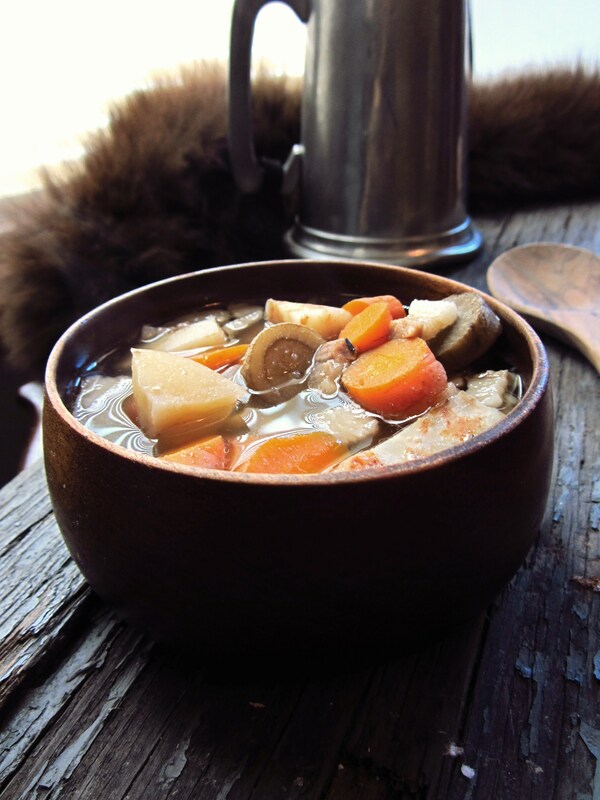 Sipping the mild broth from the comfort of your couch is a vastly different experience than coming inside from the icy winter wind to a steaming bowl of broth and carbs. Make some arctic wind noices. Sit in front of your AC unit. Or wait until winter proper (it’s coming, you know…), and try the soup after shoveling the drive or helping with snow fort construction. I promise that it will dramatically change the way you experience this meal! Cook’s Notes: These are the ingredients I used, but feel free to alter the recipe according to your tastes and what is available to you. In total, you should have about 4-5 cups of chopped root vegetables. Combine all ingredients in a pot. Simmer for 3 hours. Leave chunky or blend. I left half chunky and blended the other half to make it creamy. Consider serving with a bit of bread and cheese. That’s a great endorsement! I make that assessment two or three times a week with my own cooking. BUT, the other nights make up for it. It’s definitely a soup-of-need rather than a soup-of-want. Cersei would have someone hanged if she were served this, but north of the Wall, it’s just the thing to keep the rangers going! In keeping with the foraging idea, throwing in nettles for the last 15 min is an option. It needs my favorite root vegetable, rutabaga.